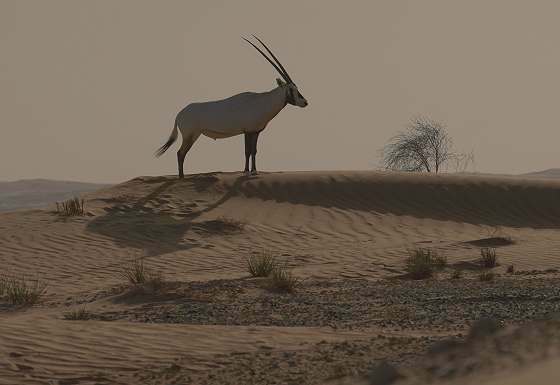 This Arabian oryx and other desert species conservation project will take you to the fascinating and iconic sandy desert landscape of the Arabian Peninsula. 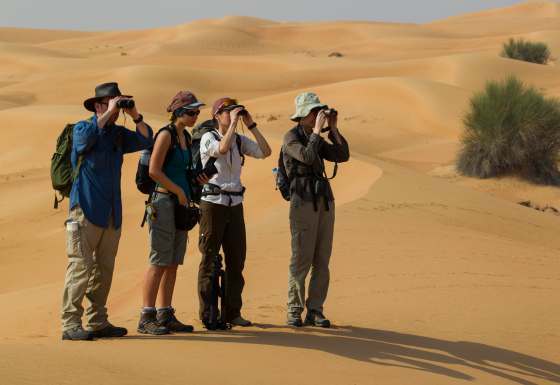 Working alongside scientists from the Dubai Desert Conservation Reserve, you will be part of a small international team, monitoring Arabian oryx, Gordon's wildcat, red and sand fox, Arabian and sand gazelles, as well as other flagship species of the desert. 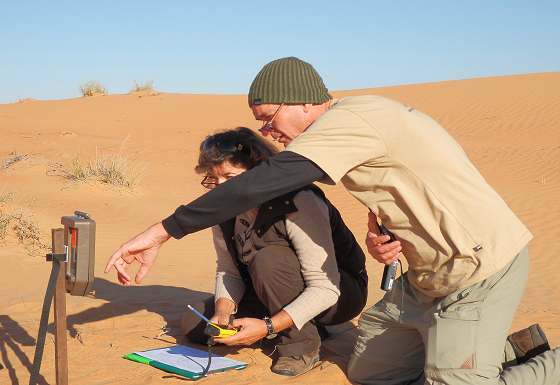 From a comfortable oasis field camp, you will venture out in the expedition 4WDs and on foot to study antelope behaviour and social structures, camera- and live-trap Gordon's wildcat, red and sand fox, and monitor them by radio and GPS telemetry. All this to ensure the survival of these important flagship desert species in their beleaguered world. Expeditions of status green have spaces available. Come and join us in the desert! Warm and dry with temperatures in the 20s ºC and an average of ten hours sunshine per day. 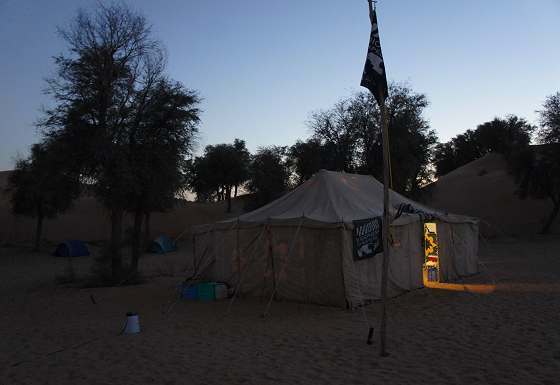 Our base is a field camp of one to two person dome, a Bedu mess and a kitchen tent set in a quiet desert oasis. 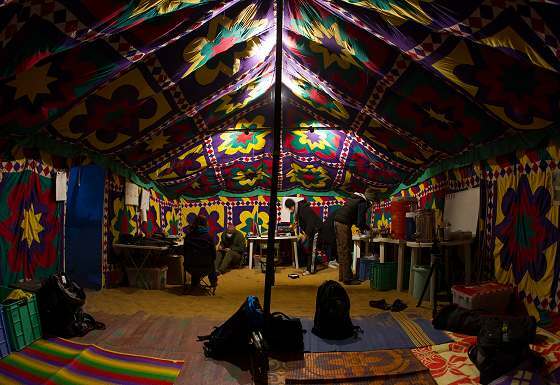 There are standard toilets and showers; each person will have their own comfortable dome tent to sleep in, and there are bigger tents for couples. Up to 12 team members + 1 local biologist + 1 expedition leader. What kind of people will be on the expedition team? Ability to walk up to 9 km per day in sandy desert terrain and the ability to tolerate heat and sometimes wind. Much of the Middle East and certainly countries such as the UAE and Oman run on foreign labour. So much so that up to 70% of people living and working in the country are foreigners, including many from Europe, North America and Australasia. They go about their daily lives just as you would at home, with crime rates extremely low, indeed much lower on average than in Europe, North America and Australasia. Terrorism is no more of a threat than at home and primarily targeted at local people. You are more likely to be hit by a bus or die from DIY, than a terrorist attack. 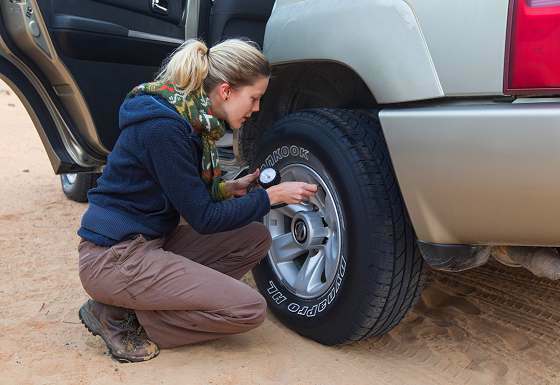 There has certainly never been any problem on the expedition or with anyone taking part in the expedition. Biosphere Expeditions, as a professional organisation, has full emergency and medical evacuation procedures in place and the expedition leader is a trained wilderness first aider. In all the years since starting operations in 1999, Biosphere Expeditions participants have never suffered any serious injuries (the worst was a broken wrist due to a slip in the mud in the jungle). We will treat you like capable, responsible adults, though, and not mollycoddle or mother you. In gaining a better understanding of the target species, through observations on their movements, habitat and food preferences and through their interaction with other species, this project will be able to ascertain what the major threats are to their continued survival. Based on this, project scientists can then develop appropriate management plans that will provide a safe environment for the target species to thrive in. The United Arab Emirates, and Dubai in particular, is well known for its rapid development over the past 40 years as well as for the mega-construction projects such as the Palm Islands and the Burj Khalifa (the world’s tallest building). Less well known is the diversity and beauty of the natural environment, from the dugongs and corals in the Arabian Sea, the flamingos in the khors (inlets) of the coastline, the rugged Hajar mountain range, to the serene splendour of the sandy dune inland desert. 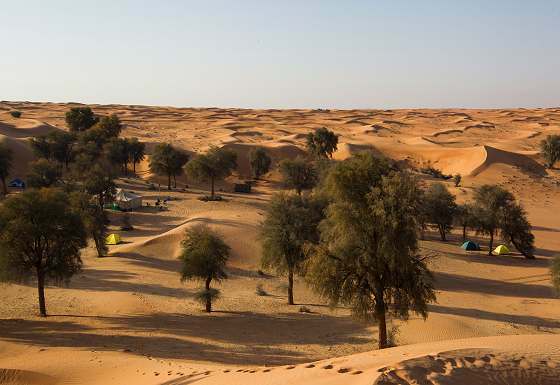 Also little known is that the largest piece of land given to any single project in Dubai was for the establishment of the Dubai Desert Conservation Reserve; at 225 km², 4.7% of Dubai’s total land area, and the expedition’s study site. 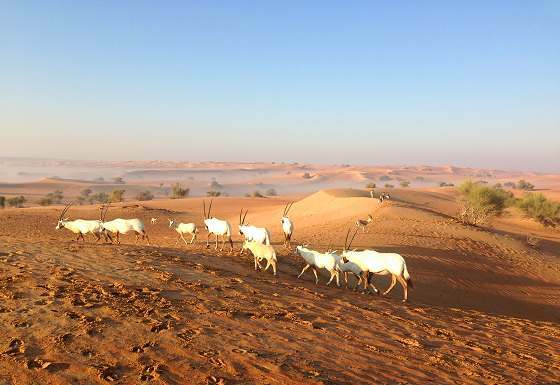 The Arabian oryx is the largest of the antelopes in the region and it is very well adapted to the extremely arid environment. Oryx once roamed all across Arabia, but the advent of firearms saw their rapid decline. 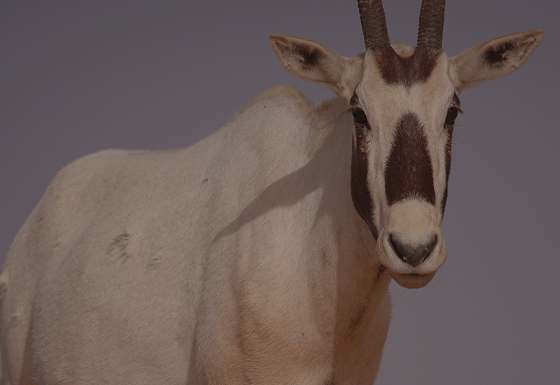 Since 1986 the Arabian oryx is classified as “Endangered” on the IUCN Red List, but was already "very rare and believed to be rapidly decreasing in numbers" in 1965. Re-introduced into the DDCR in 1999, the population has steadily grown from the original 100 individuals to over 500 today. 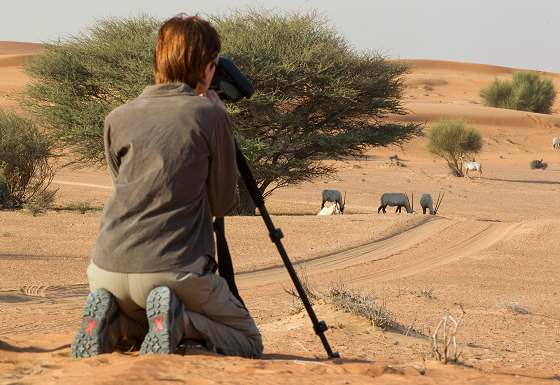 For the next phase of the oryx project, local scientists need a greater understanding of how oryx fit into the DDCR’s natural environment, which habitats and plants they prefer, what the social structure of the herd is and how this is affected by the environment. This can only be achieved through monitoring for which Biosphere Expeditions will provide the manpower. The Gordon’s wildcat looks very similar to and is the same size as a domestic cat. 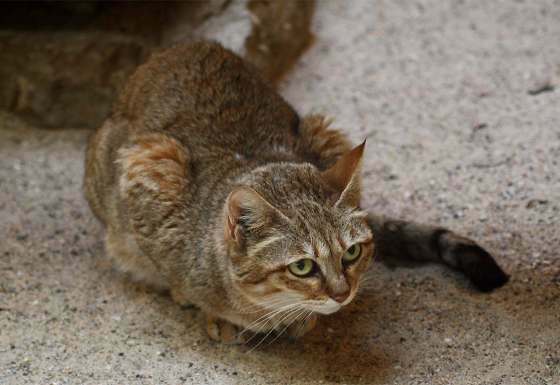 Indeed, the biggest threat to the survival of the Gordon’s wildcat as a species is the interbreeding with feral or domestic cats, which could lead to its extinction as a distinct species. Very little is known about the Gordon’s wildcat population within the DDCR; the last population estimate was done in 2004. This expedition will enable DDCR scientists to update information on population size and distribution as well as conduct a DNA study of the species; information that is important for informed management decisions to be made and threats to be averted. 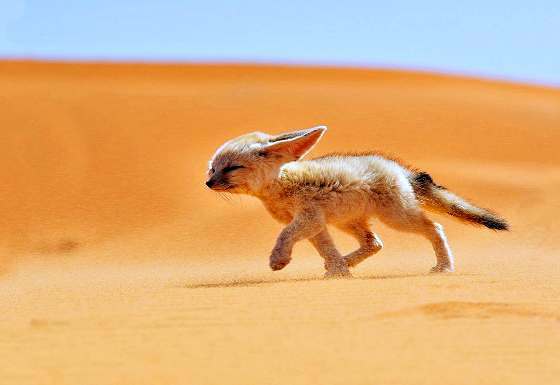 The sand fox, also known as Rüpell’s fox, is a desert-adapted carnivore. Although it is in the IUCN category “Least Concern”, little is known about its habitat and ecology. Threats include direct and indirect persecution by hunting and indiscriminate use of poisons. 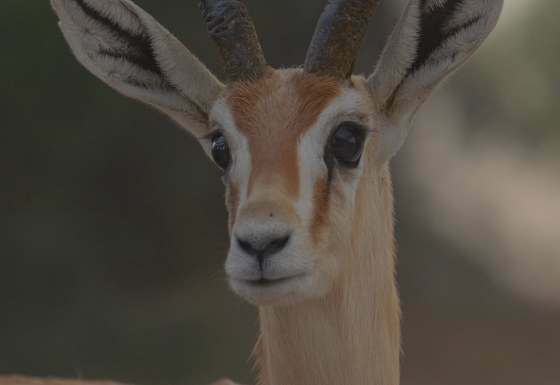 The sand and Arabian gazelle are in IUCN categories Endangered and Vulnerable respectively. 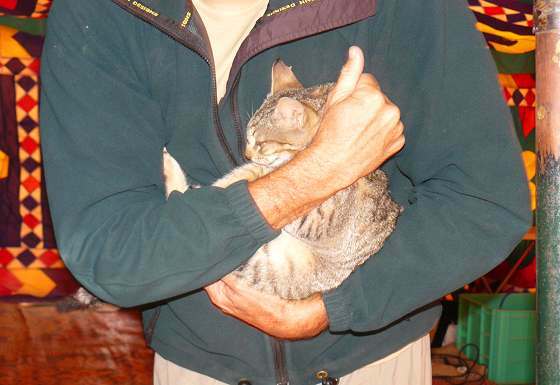 Major threats include illegal hunting for meat and live capture for pets and private collections. Habitat loss through agricultural development, fencing pasture for cattle, construction of roads and settlement is also a major threat. 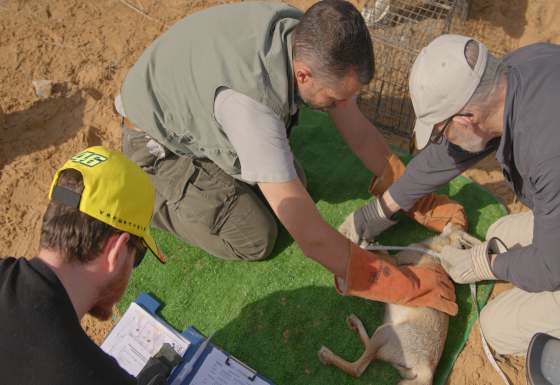 The DDCR is critical refuge for these gazelles and their numbers and ecology need to be monitored regularly. Finally, the three flagship birds that will be monitored by the expedition as well are classed by IUCN as Vulnerable (Macqueen’s bustard and lappet-faced vulture) or Least Concern (desert eagle owl). All three species serve as important indicators of ecosystem health and integrity. 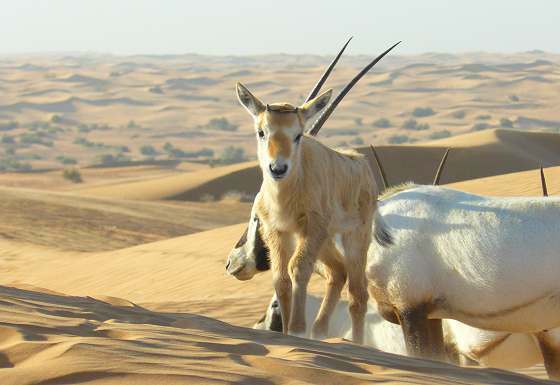 Arabian oryx (Oryx leucoryx), Gordon’s wildcat (Felis silvestris gordoni), Arabian red fox, (Vulpes vulpes), sand fox (Vulpes rueppellii), sand gazelle (Gazella leptoceros), Arabian gazelle (Gazella gazella), Macqueen's bustard (Chlamydotis macqueenii), desert eagle owl (Bubo bubo), lappet-faced vulture (Torgos tracheliotos). Other species present, all in true sandy and rocky desert habitat: Arabian hare, Ethiopian hedgehog and the lesser jerboa. There are also a number of reptiles, such as the monitor and spiny-tailed lizards, and both residential and migrating bird species, such as the long-legged buzzard. 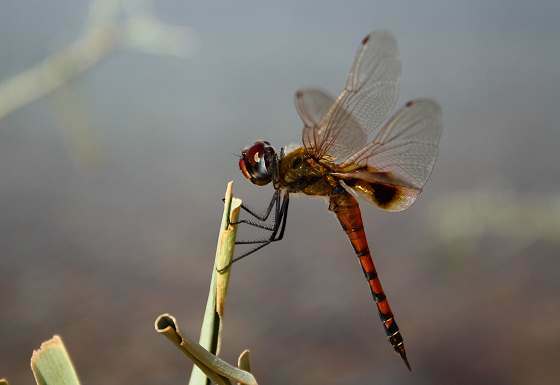 All in all, 74 plant, 18 mammal, 26 reptile, 140 bird and 300 insect species have been identified in the DDCR. Specific activities are usually decided the night before or in the morning. The whole set-up of the expedition is quite flexible so that you can participate according to the weather (usually sunshine and warm temperatures), your skills and general fitness and how you feel on the day. 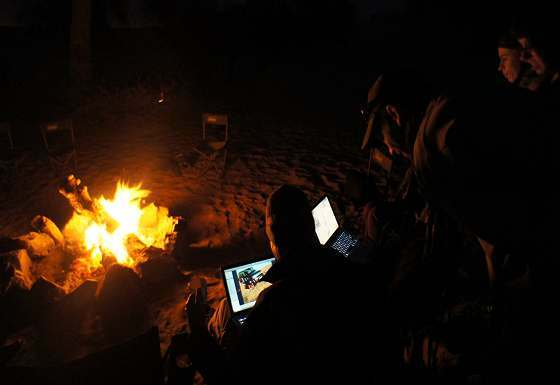 Your typical day may consist of taking your survey group’s 4WD into the desert to (1) check, service or set live or camera traps, or (2) find observation points using your GPS and conduct area surveys from there to record data of oryx, gazelles and other study species, or (3) find red fox dens using your GPS and classify them according to activity level at the den sites or (4) assist with collaring wildcat or sand fox, or (5) record flagship bird and other species of interest as you come across them. 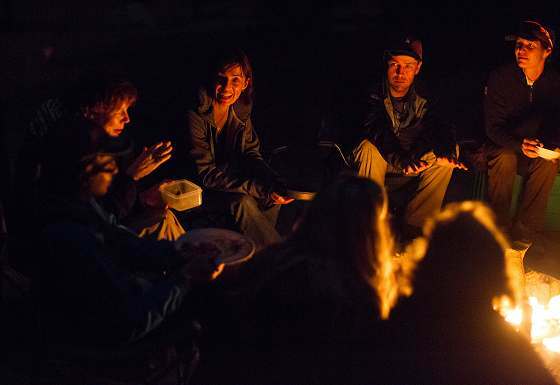 Research groups will return to the field base for the night for dinner. Please note that every member of the expedition will be rotated through all activities. 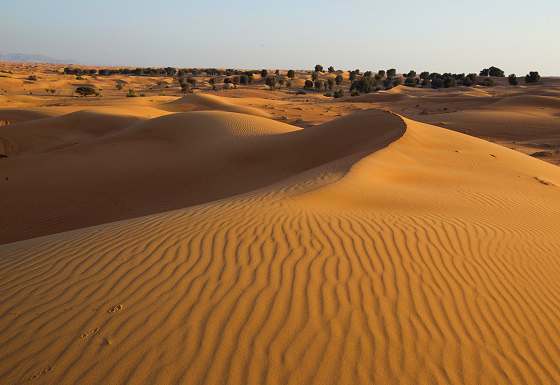 The Dubai Desert Conservation Reserve (DDCR) is an area of 225 km² that comprises 4.7% of Dubai’s land area. Conservation in this area started in 1999 when the Al Maha Desert Resort was opened within a protected area of 27 km² (Al Maha Reserve). 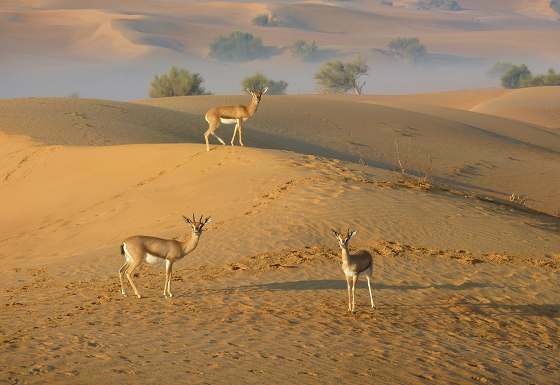 One of the first conservation actions of the reserve was a wildlife reintroduction programme for Arabian oryx and the two indigenous gazelle species (sand as well as Arabian gazelle), as well as programmes for the protection of other key components of the ecosystem, in particular the vegetation (close to 6000 indigenous trees were planted in 1999 to create a natural seed bank, which has now led to germination of indigenous plants). In 2001 the resort management began a major environmental audit of the surrounding area. Following this audit a proposal was submitted to the Dubai government on the formation of a formal national park. 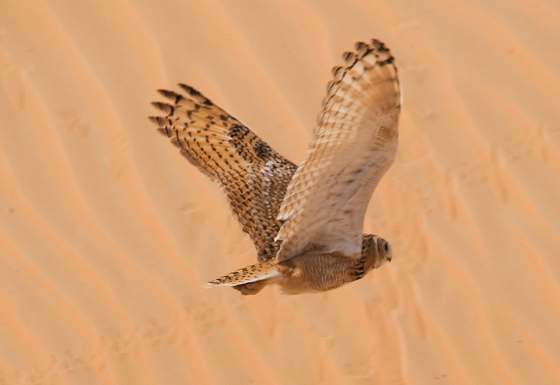 The proposal was accepted and sanctioned almost immediately and work began on protecting the area to be known as the Dubai Desert Conservation Reserve. 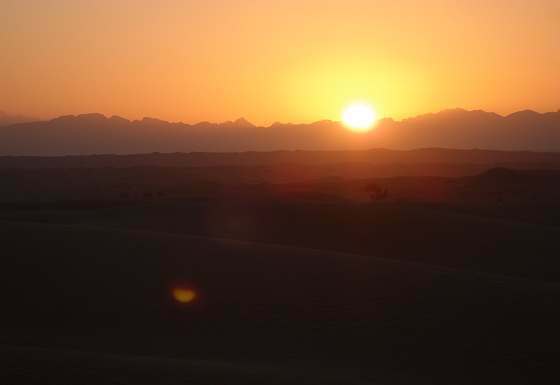 Today the DDCR is a representative of the Dubai inland desert ecosystem and is characterised by a sandy desert environment consisting of sand dunes interspersed with gravel plains. 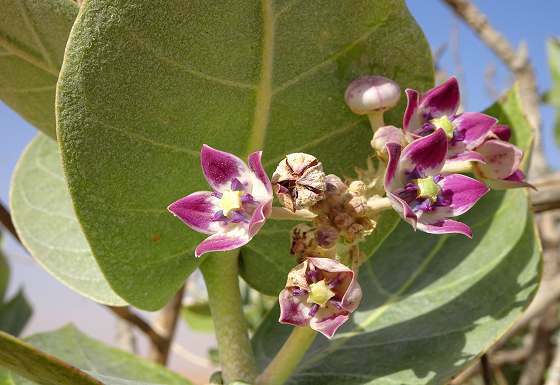 There is one rocky outcrop in the north of the reserve, which provides nesting sites for the desert eagle owl and two groves of rare ghaf trees (Prosopis cineraria). 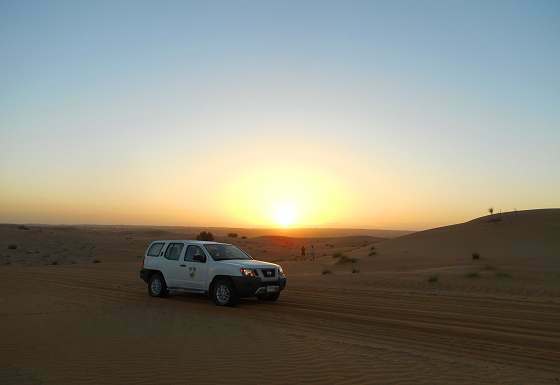 Our main partner on this expedition is the Dubai Conservation Board, a government-appointed organisation concerned with the conservation and protection of the Dubai inland desert. Other partners include the National Avian Research Centre, whose rangers will assist with training for tracking the bustards. Corporate and logistical support comes from Arabian Adventures and Al Maha Resort & Spa. 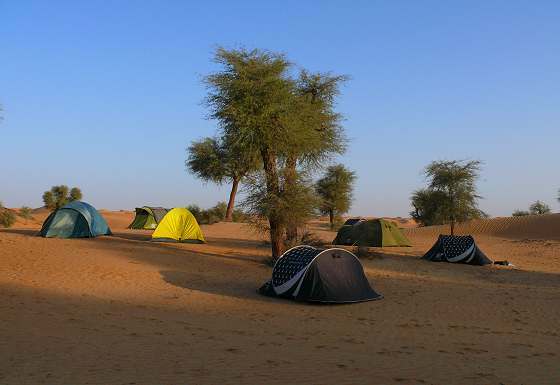 This project was named on The Independent's "Best Desert Adventure Holidays" list. This project was named on Get Losts's "Top Trips: Great small group adventure across the globe" list. This project was named on The National's "World's most interesting (and conservation-focused) wildlife trips" list. Biosphere Expeditions as an organisation has won the "Best Volunteering Organisation" category of the First Choice Responsible Tourism Awards. 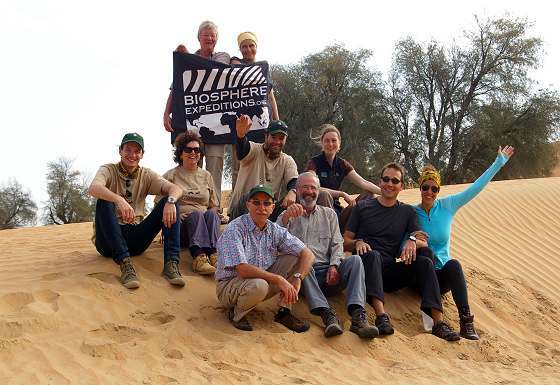 Since starting its partnership with the Dubai Desert Conservation Reserve (DDCR) in 2012, Biosphere Expeditions has made many important contributions to the management of the reserve and its rare species. Initially expedition work prompted the DDCR to change oryx feeding patterns, resulting in a much healthier population. Rare Gordon’s wildcats and a very rare and elusive sand fox were captured by the expeditions over the years, prompting the reserve to increase research and conservation efforts for these threatened species. Monitoring of vegetation and herbivore distribution by the expedition is helping to inform conservation priorities and camera trap results continue to add to the DDCR’s fauna list, including a very rare cinereous vulture (Aegypius monachus) record. Finally, data gathered by the expeditions showed that the introduction of an apex predator (such as the Arabian wolf or the Arabian leopard) would be beneficial. 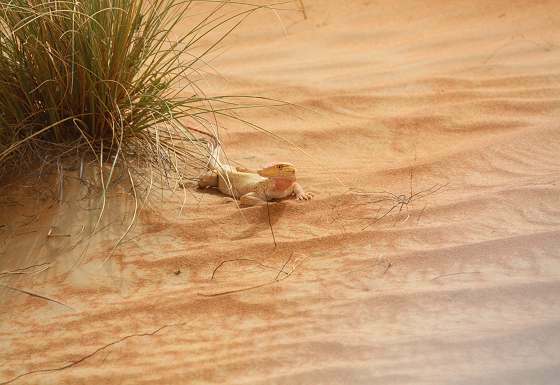 The UAE government accepted these arguments and the DDCR is now investigating processes and options to make what will be a major showcase conservation success story for Arabia become reality. 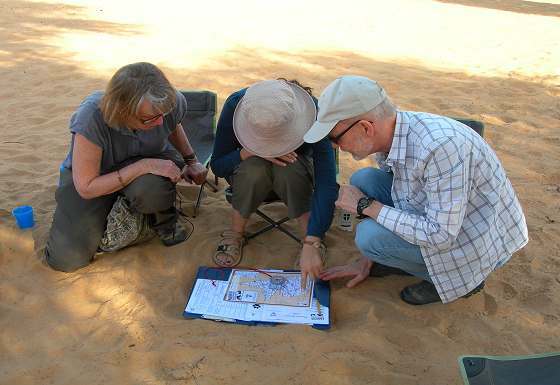 "Our exciting collaboration with Biosphere Expeditions will expand our primary goal of desert conservation, through active research and conservation work by expedition participants volunteering in the UAE. 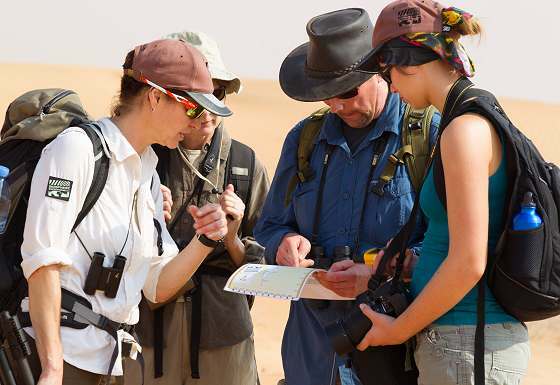 Observations and data collected by the participants will enhance our understanding of the desert environment and help us achieve our ultimate goal of ensuring rare desert species survival in the wild." 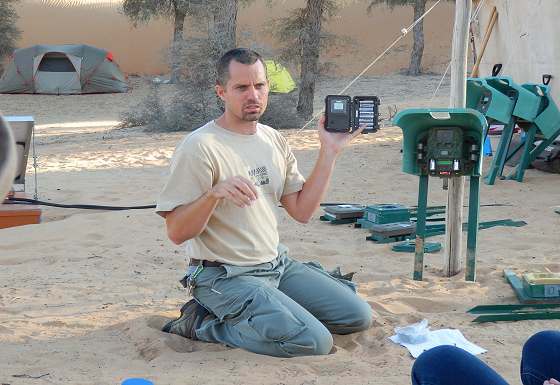 Stephen Bell, Conservation Officer, Dubai Desert Conservation Reserve & local scientist. "For a person like me loving the winter time, cold and snow, the desert is probably not the right place to go. BUT, when you work with great people that all share the same values, such as contributing to conservation of wildlife and biodiversity, it doesn't matter whether it is hot or cold or whether you are in snow covered tundra or a sandy desert. It's a great feeling to have become part of the Biosphere family and I promise to stay part of it." Peter Gosnell, 49, travel journalist from Australia. "It was a great and new experience to focus yourself on small details on the ground, which are so important for the big aim. After a while you feel a peace inside yourself, being in a great environment together with a great team."